Do you wish to give extra mileage to your campaign, then it is important to invest wisely in promotional product that works. 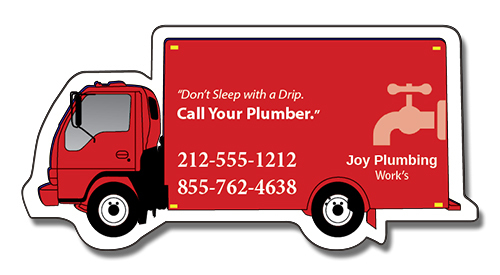 This custom 4.5 x 2.25 delivery truck shape full color magnet is a best choice for lending wheels to your campaign. It can be availed by transport companies, and others having delivery trucks to promote their business with the clients. This magnet is offered in customer friendly prices and you can make huge cost cutting in your advertising budget by ordering it in bulk. Request a quote to know price discounts on wholesale personalized delivery truck shaped full color magnet. Product Size: 4.5 in. x 2.25 in.